Hello Puppies, it is me, Magnum. 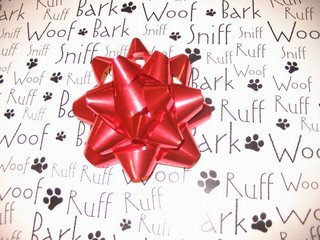 I have let Lucky post the past couple times, but I want to tell you all about the care package we sent. 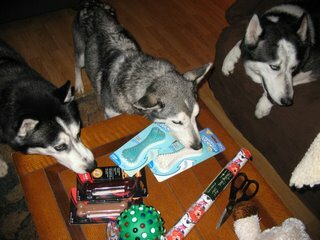 Mama and Papa went to visit our former foster sister, Chena, on Sunday. 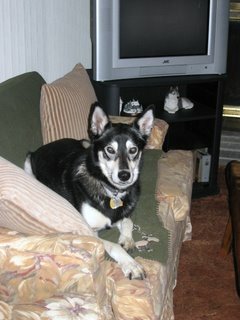 Chena came from a sled dog team in Alaska where she was badly mistreated. She spent almost a year in MaPaw and she lived with me some of that time. Finally, she went to live with a woman who works from home. Chena was terrified of being left alone and she never trusted men, so it was her perfect home. 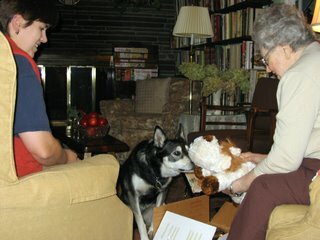 Then we heard she had been finding naughty ways to entertain herself, so we decided to send some toys. Lucky and Angel checked out all the toys and treats. Angel just came to live with us that day and was excited to join in the activity. I will help her introduce herself in a few days when she is feeling a little less shy. Okay, I am not so good at spatial relations. 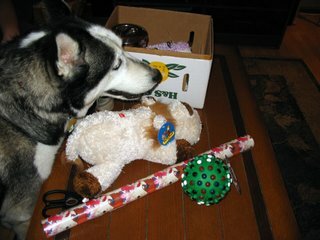 How do I get all these toys in this box? Does anyone else think it is a bad idea for me to use tape? 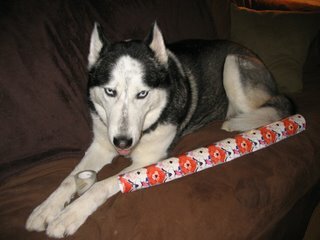 Fur, no thumbs, and tape seem like a bad combination. 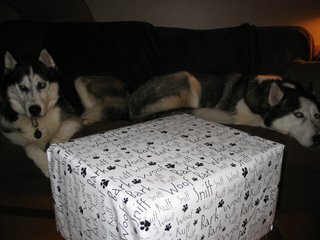 Papa helped us wrap it (he has thumbs) but something is missing. Lucky figured it out and added the finishing touch. We were feeling pretty proud of ourselves. 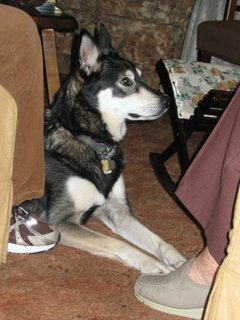 Here Chena was lying on Mama’s feet listening to her new mama tell stories about her. 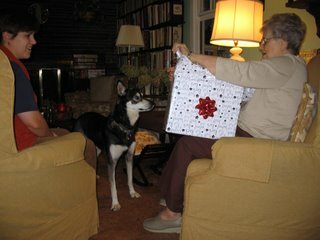 Chena’s mama also has thumbs, so she helped Chena open her gift. 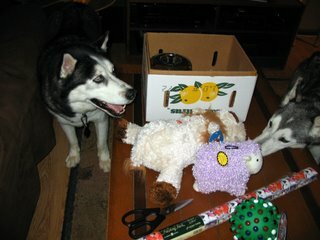 Chena checked out the toys we picked. 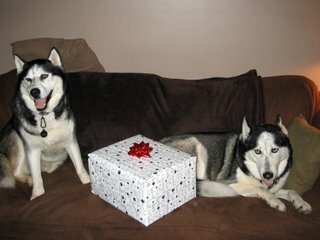 It was nice to see that Chena is happy in her new home. 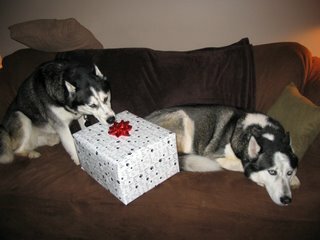 I hope she likes everything we sent.